Linda Bailey is the Executive Director of NACTO. Prior to this position, she was the federal policy advisor for New York City Department of Transportation for six years. She has been working in U.S. transportation policy for 12 years, with a career that has spanned research, advocacy, and implementation, always focusing on sustainability within the transportation sector. In the last three years, she has overseen the publication of two new national design guides, one for bicycle facilities and another for urban streets, for the National Association of City Transportation Officials. Before working for the City of New York, she worked for six years on national research projects regarding the intersection of the environment, health and transportation. 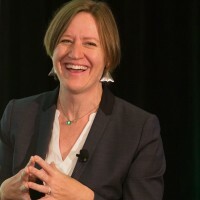 Her publications include Aging Americans: Stranded without Options; The Broader Connection between Public Transportation, Energy Conservation and Greenhouse Gas Reduction; and Improving Metropolitan Decision Making in Transportation: Greater Funding and Devolution for Greater Accountability. She also contributed to Mean Streets; Measuring the Health Effects of Sprawl; Clearing the Air; and Driven to Spend. Ms. Bailey has a Master’s Degree in Urban Planning from the University of Michigan.